An example of polygons. The land is the southwest corner of Ukolnoi Island. Note how the polygons nearest to land somewhat follow its contours. Remember, these are uncharted waters. If you have spent any time reading the Ship Logs from other Teachers at Sea, you are probably familiar with the fact that each involves a different type of work. 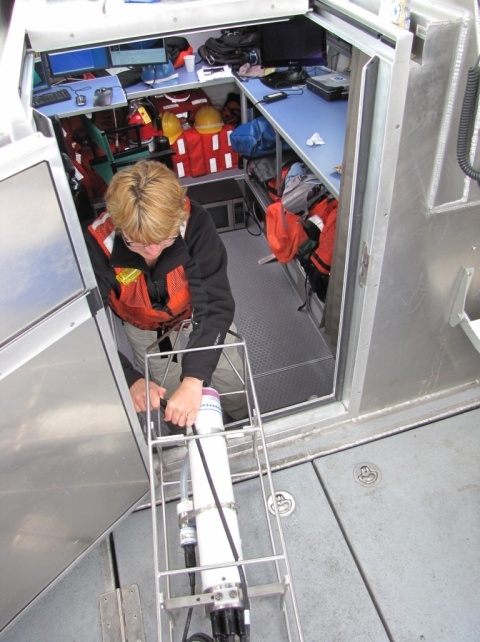 On Rainier, we are focused on conducting hydrographic surveys. This means that we collect data on the characteristics of the ocean bottom as well as the nearby coastline. We work seven days a week; from early morning and well into the evening. There are six launches (30 foot aluminum boats) on Rainier, each with a multi-beam sonar attached to the bottom of the hull. One of the launches has the capability to conduct surveys with side scan sonar. Each day, crew members work from what is called the POD (Plan of the Day). The POD is issued the evening before by the FOO (Field Operations Officer). Usually, four launches are sent out daily to collect multi-beam sonar data. On board are the Coxswain (drives the launch); the Survey Technician (in charge of data collection), the Assistant Survey Technician (AST) and the Teacher at Sea (me). To give you an idea of what a survey day is like, here is a brief summary. Each day, the launch party is given a set of “polygons” to survey. A polygon is an imaginary closed area. You may remember this from geometry class. 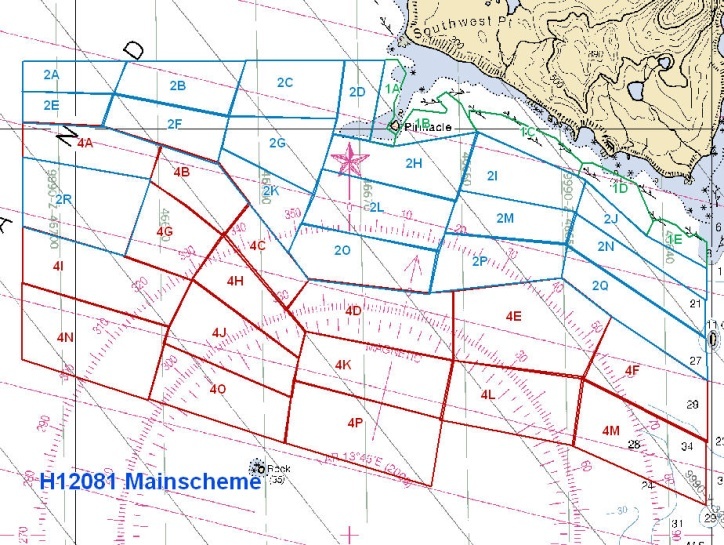 The polygons drawn on the working charts generally follow the contours of the islands. It is impossible for the Survey Technicians who created the polygons on a survey area or “sheet” to know how the contours look underwater. Why? Much of our survey work is in uncharted waters, which mean that no one has ever mapped the ocean floor in this area of Alaska. Thus, the work can be dangerous and every effort must be made to ensure the safety of all. As the launch moves forward, the multi-beam projects a rendition of the ocean bottom in the form of a line (screen on right). I am taking a turn at making sure the beam remains within certain parameters (screen to right). The coxswain begins by driving the launch near the area where we will start surveying for the day. Before we begin, we must take a CTD cast. CTD stands for Conductivity Temperature and Depth. The water’s salinity, temperature and depth can all affect the multi-beam data. The composition of the water column varies from location to location. Some areas may be affected by glacial runoff and therefore be fresher and colder at the surface than others, for example. Sound travels faster in warmer, saltier water, therefore; we must know the levels of each of these variables, as well as depth (pressure) in order to obtain an accurate set of multi-beam data. The CTD data is applied to the multi-beam data to correct for sound speed changes through the water column. This occurs later in Rainier’s Plot Room where all of the launch data is processed. Casts are made every four hours or before beginning an acquisition for the day. After the CTD data has been downloaded the coxswain begins to “mow the lawn”. The launch is driven in lines that are as straight as possible, overlapping the previous pass a little so there are no gaps, or “holidays” between passes. As the launch moves forward, the multi-beam produces a series of pings which create a swath (a triangular shaped path of sonar beams). The widest base of the triangular swath is on the ocean bottom with the launch at the top. As the pings bounce back, they create various images that determine depth. The work requires constant adjustments and vigilance, since underwater features may present themselves at any time. We do not want to hit them. The area we were surveying when this shot was take was between 20 and 50 meters (greens and darker blues). By watching the swath, the technician and coxswain can determine the approximate depth below, including any features like rocks, shoals, or underwater peaks and valleys. If you use a ROYGBIV (rainbow) color scheme, the points closest to the surface(less than 8 meters) show up in red. The more submerged the features or ocean bottom are, the more the colors move toward the deepest blue. For example, the lightest greens begin the depth range at 20-35 meters. This is especially helpful where there is no previous data. Can you think about why a coxswain might be very interested in knowing the places where the colors on the screen are turning from green to yellow to orange? When a polygon is finished, it should look like it has been “painted in” with colors representing various depths and features of the ocean bottom. After completing a polygon, the data is saved and we move on to another polygon; take a CTD cast and start the whole process all over again. We return to Rainier by 16:30 (4:30 pm) unless weather and sea conditions are favorable, in which case the FOO can decide to run late boats until 17:30 (5:30 pm). The data is then handed over to the Night Processing crew who apply filters and correctors to the raw data. The tide and sound velocity are the main culprits in skewing data. In addition to tide and sound, things like bubbles in the water, schools of fish and kelp beds (of which we’ve seen many) can also affect how “clean” the data is. This is just a preliminary check. If the data is bad, we have to go out and survey the polygon again. After many days (sometimes weeks and months) of processing and checking, the data is used to create high-resolution, three-dimensional models of the ocean floor (on paper or computer). These models will eventually leave Rainier and will be used by NOAA’s Pacific Hydrographic Branch to create nautical charts for mariner’s use. The CTD is lowered on a winch at 1 meter/second. After retrieving the CTD, I prepare it for downloading. I feel like I’ve been on Rainier for a long time, even though it’s only been six days since we left the dock in Seward. There is a definite routine established from when I wake up at 06:15 until I go to sleep around 11:00. My head is bursting at the seams with new knowledge and things to remember and keep straight. It’s great to be a student again—everything is new. The technology component of Rainier’s mission is nothing short of mind-bending. How the survey technicians can keep all of the programs and how to use them straight, I don’t know. I have pages of “cheat sheets” to use to help me remember what to click on and in what order. Anyone who loves technology would love the job of survey technician. This is especially true here in the Pavlofs where you might be the first person to discover an interesting underwater feature or maybe a shipwreck. That would be “wicked cool”, as my students would say. I have been on three different launches with three different teams. I bring this fact up because, although each team has the exact same goal in mind (collecting accurate hydrographic survey data), each individual tackles the tasks somewhat differently. For example, one coxswain might like to maneuver the launch so that the edge of the multi-beam sonar’s swath touches the inside edge of the polygon. Another might make their first line by maneuvering the launch straight up the middle of the polygon’s edge. Another example involves how survey technicians control the parameters of the multi-beam. Some like to adjust the settings manually and some like to use the auto pilot. RAINIER is operated by officers of the NOAA Corps. NOAA Corps is the smallest of the seven uniformed branches of the U.S. Government. It can trace its roots back to the presidency of Thomas Jefferson, who, in 1807, signed a bill for a “Survey of the Coast”. This eventually became the Coast and Geodetic Survey. Men were needed to commit to long periods of time away from their families to survey the growing nation’s waterways and coastlines. Instead of using multi-beam sonar, they lowered lead weights on ropes marked off in increments to measure ocean depth called leadlines. To watch an excellent movie on the history of NOAA and surveying, go to the website. On the Wosnesenski Island, we have seen many feral cows. According to some of the crew, there once was a homestead on this remote, treeless island. When the family left the island, the cows remained. No one takes care of them. There are other documented feral cow herds on other islands in the Aleutian Chain, including Chirikof Island, near Kodiak Island. Do you think you would like to live on an island that has no trees? Why or why not? 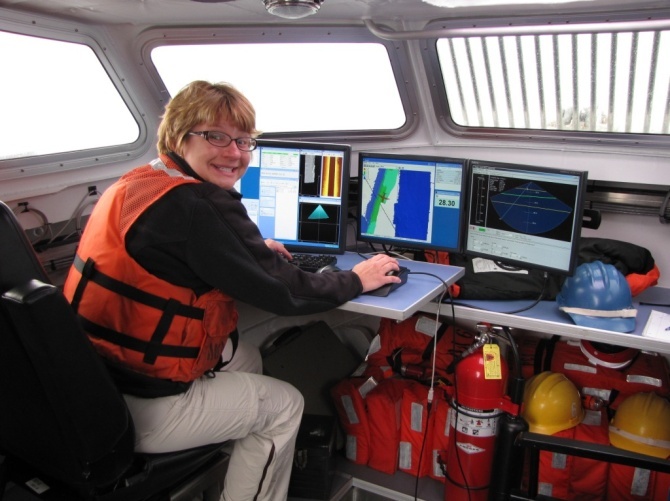 This entry was posted in 2009, NOAA Teacher at Sea, Stacey Klimkosky and tagged CTD, Hydrographic survey, multibeam sonar, noaa ship rainier, pavlov islands, polygon, seafloor mapping. Bookmark the permalink.